The fiddle and fretless banjo duets played by Tommy Jarrell and Fred Cockerham distill the music down to its very essence. For those hearing these two great rural country musicians for the first time, this stark approach to music may be a revelation and yet, at the same time, you may find that it has an unrelenting intensity that takes time to become accustomed to. As you listen more and more, you will find that layers will unravel revealing the richness of their music and the cunning way in which it was devised. Much of this old time way of playing music originated from growing up in the South in the early 1900s, when entertainment had to come from within the community . There was time to savour life’ s great joys and to be keenly aware of its immense difficulties. Uppermost Surry County, the area of North Carolina where Tommy Jarrell and Fred Cockerham grew up, is located at the base of the Blue Ridge Mountains on the beginning of the Piedmont, a plain which extends far into North Carolina. On one side you would see Fisher’s Peak looming far above you and, as you turn your head, you would see the land flatten out except for an occasional hill like Round Peak, after which the immediate area is named. Growing up in the Round Peak area just after the turn of the century, only 36 years after the end of the Civil War, meant isolation from all but the most nearby communities. During rainy periods, the roads, made mostly of red clay with no gravel, became so muddy that wagon wheels would sink in up to their axles. This made travel during parts of the year either difficult or impossible. New tunes only slowly made their way into the area, often by visitors or because a community member made a trip outside of his locality. January 22, 2009 – Judy Hyman plays fiddle in a band called The Horse Flies. In her living room in Ithaca, N.Y., there’s a pine-wood dresser right next to the couch. It’s not for shirts and sweaters — this used dresser holds hundreds of precious cassette tapes, an archive of rare recordings that spans more than three decades. She recorded many of them herself; the rest were gifts from other musicians and collectors. 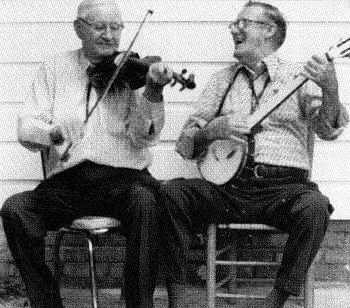 Hyman’s treasures include recordings of Jim Bowles and Harold Hausenfluck — both fiddlers, from Kentucky and Virginia, respectively. Their music is called “old-timey.” It’s what came before bluegrass. This music has been passed down from generation to generation, and from musician to musician. There are versions of songs particular to different regions, and even to different families. Recordings of these very particular performances — made in living rooms, kitchens and on front porches and called “field recordings” — are essential tools for anyone who wants to play this type of music. Alden is a banjo player, a friend of Hyman’s and a retired math teacher. One of the people he studied with was Fred Cockerham, a musician from Surry County, N.C. During his summer vacations, Alden scoured the South, looking for musicians. A few years ago, Alden began to wonder what he was going to do with his collection of field recordings. He considered giving his collection to the Library of Congress, or to a university. However, Alden says he worried that they’d be hard for musicians like him to access, and that they’d gather dust lying on a metal shelf. Besides, what librarian in his or her right mind would let someone into the stacks with a banjo or a fiddle to learn a rare ballad or breakdown? “If the people who are really interested and want to play it or hear it, have difficulty assessing it, what good is that?” Alden asks. Alden talked to a few of his friends, like Hyman, and together they came up with an idea: Why not preserve their old recordings themselves? They call their ad hoc group The Field Recorders’ Collective. They decided to use the Internet to bring this little-heard music to a new audience. Every year, they remaster and release 10 to 15 old recordings. Using their home computers to edit audio, the collective then packages every CD in a simple cardboard sleeve. Liner notes are available online, with photos. Tapes come from backyard jam sessions, house concerts and music festivals from all over the country. The majority of the music probably wouldn’t interest most commercial labels. A few years after he dropped out of Harvard in the 1950s, Field Recorders’ Collective member Peter Hoover made a tape of musicians Wade Ward, Uncle Charlie Higgins and Dale Poe. Doing his best to make them feel comfortable, Hoover shared meals with them. He listened to them play music in their living rooms, and refrained from dragging out his suitcase-sized reel-to-reel recorder until the wee hours of morning. Today, Hoover, Alden and the other members of the Field Recorders’ Collective — almost two dozen of them — do everything as inexpensively as they can. After they cover their costs, they send the rest of the money to the families of the musicians they recorded. The Field Recorders say they hope other musicians can learn from the men and women whose sounds are preserved on the CD’s — many of them gone — who played the music of their grandparents and whose children still carry on that folk tradition.